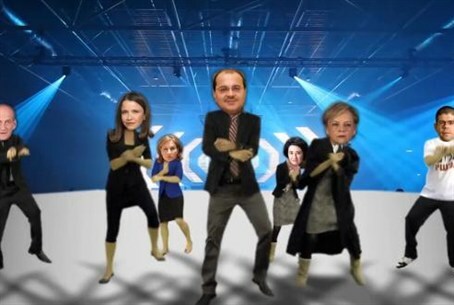 Likud MK Ze'ev Elkin's "Gangnam Style" takeoff gets 250,000 views. Coalition Chairman MK Ze'ev Elkin (Likud) is known for his shrewd political sense, and he appears to have a good promotional instinct as well. The video clip for his Likud primaries campaign has broken all known records for such clips, with over 250,000 views in just a few days. The clip is a takeoff on the global hit "Gangnam Style" and is called "Elkin Style". It promotes Elkin's Knesset activity by featuring his leftist and anti-Zionist rivals complaining about how he has thwarted their actions. Created by Rugatka Productions, the clip features, among other things, animated versions of MKs Ahmed Tibi and Hanin Zouabi, who complain about a law he introduced against promotion of anti-Israel boycotts. Former Supreme Court President Dorit Beinisch and Labor leader MK Shelly Yechimovich are seen whining about how Elkin won't let them run things anymore, and how he placed a "settler" in the Supreme Court. Former Prime Minister Ehud Olmert complains about the Elkin-sponsored law that requires a national referendum for approval of any diplomatic agreement involving the ceding of land. Former Kadima head Tzipi Livni and Peace Now head Yariv Oppenheimer, who complains about the law requiring transparency about sources of his organization's funding, are also in the cast of animated characters. The characters then join in a request to voters to please not vote for Elkin, because with him, "Likud did not just win the elections – it came to rule."